If you hate the hovering hosts and Victorian vibe of old-school New England bed-and-breakfast inns, here’s one that’s an antidote to all that chintz. Gilded, a sister property to The Attwater, opened May 8 in the former Brinley Victorian Inn in Newport. 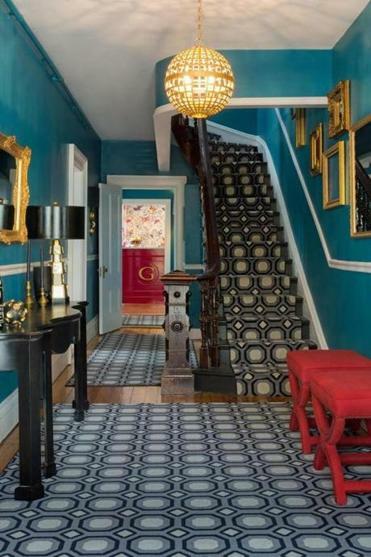 Set in a quiet residential neighborhood a few blocks from Thames Street, Gilded is a paint box of vivid hues of peacock, fuchsia, and purple, designed by Boston’s Rachel Reider Interiors. The new owners, Lark Hotels, didn’t change the architectural details of the house (foyer pictured below), but went playful with color and eye-catching accents, like butterfly-printed patterned wallpaper and a plush purple settee. Seventeen guest rooms and suites are set in the main house and a carriage house, attached by the breakfast room. Guest rooms are unique, ranging in size from 145 to 411 square feet (that’s the Lark Suite, the best room in the house), with 40-inch LED TVs and iPads preprogrammed with local information. Wi-Fi is complimentary. Breakfast, included in the room rate, is a bit different, too, featuring a collection of small plates like a grapefruit and avocado tostada and bananas brulee with walnuts, honey, and cinnamon. The five or six dishes might include a breakfast salad or a pizza among the savory options, plus pastries, homemade bread, and yogurt. Afternoons bring “G and Tea” time — Gilded provides the mixers if you bring the booze, not a difficult thing to procure in Newport. When the weather warms up, bring your tipple to the outdoor courtyard, where a croquet set is ready to go (a nod to Gilded Age amusements), or test your skills at the custom-made white lacquer billiards table. As always, Newport is a happening haunt this summer, with a roster of events that includes three music festivals (including the Newport Jazz Festival, July 31-Aug. 2), and the 20th anniversary of the Newport Flower Show (June 19-21, at Rosecliff Mansion, birthplace of the American Beauty rose). Hotel rooms in high season are typically pricy, and most have two-night minimums on weekends. Gilded is somewhere in the middle of the market. The Gilded team can set you up with a sailing trip or dinner reservations, so you get the service of a hotel with the intimacy and feel of staying in a neighborhood. Call it a modern take on the B&B experience. GILDED 23 Brinley St., Newport, R.I., 410-619-7758, www.gildedhotel.com. Summer room rates from $249 (midweek); $329 (weekends.) Two-night minimum stay required on weekends from May to mid-October; three-night stay required for some festivals and holidays.